Verstappen was in the lead at Interlagos on Sunday when back marker Ocon attempted to unlap himself. Their Red Bull and Force India cars came together, forcing the Dutchman to spin off the track. Verstappen’s misfortune saw F1 champion Lewis Hamilton pass him and hold on for victory. Max Verstappen and Ocon almost came to blows in the paddock post-race as the Dutchman pushed his old rival. 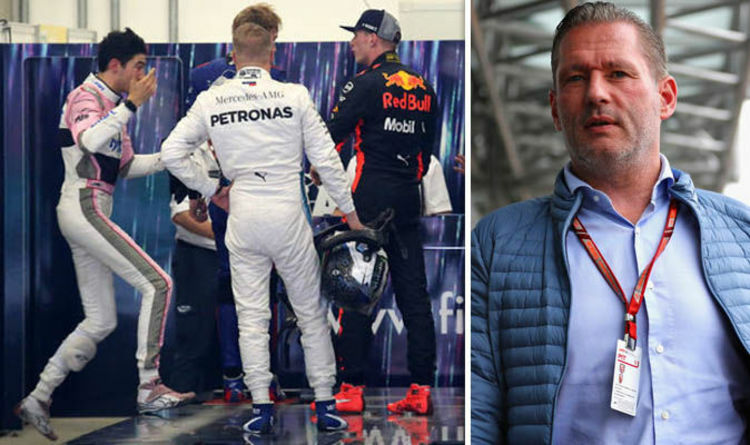 Verstappen’s father, a former F1 driver himself, has now offered his take on the incident. And he’s put the blame on Ocon for provoking his son by laughing when he was confronted over their on-track crash. “Maybe what Max does is not good, but I fully understand him,” Verstappen told Dutch newspaper De Telegraaf. “He is deprived of the victory and then Ocon is laughing so stupidly. He played the innocent victim. “Of course you will get a story. We must not make it bigger than it is. “I see football players push each other this way every weekend. “Max is professional enough not to hit someone, I know that 100 per cent sure. “I think he really controlled himself and it was good that people were around it. Verstappen went on to discuss his son and Ocon’s rivalry, which dates back to their junior days. “They obviously have a history,” Verstappen added. “In Formula 3 Ocon was indeed European champion, but that was because he had by far the best car and Max had a lot of bad luck that year. Verstappen will be desperate to bounce back from missing out on victory in Brazil at next week’s Abu Dhabi Grand Prix.